When it comes to plant-based food, the world is gray rather than the black and white vision of the organic food advocates. All foods contain negatives provided by Mother Nature as a part of life. Many people automatically deem organic foods, as super good for their health, while regular produce purchased at a regular grocery store is glibly characterized as evil or unfit for human consumption. But, is this true? As a part of life, all naturally grown plant-based foods contain food negatives - pesticides, carcinogens, mutagens, and even clastogens - regardless if they are organically grown, GMO free, or NOT. Pesticides can be classified as either naturally produced by all plants or synthetic in origin. A carcinogen can cause or aggravate cancer. Mutagens can induce or increase the frequency of mutation in your body. While a clastogens can cause breaks in chromosomes, leading to sections of the chromosome being deleted, added, or rearranged. Improve your Nutrition at the Intermediate Level. Being experienced, you can now tackle harder challenges. At the intermediate level, start working on your addiction to sugar while you continue to move away from consuming junk food towards more healthy whole foods. Plant-based foods contain trace amounts of undesirable chemicals. 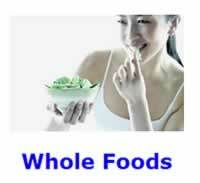 Variation in your diet is a fundamental principle of all healthy diets. Variation in what you eat is more about minimizing the food negatives in your diet then it is about maximizing the positives of your food. Furthermore, your body's natural detoxification system helps to protect you from these food negatives. Several arguments support the world being gray rather than black and white when it comes to plant-based foods. Humans over the eons figured out by trial and error, which plants would kill you out right if you ate them, and which plants were safe to eat. Humans eventually discovered how to cultivate these safe plants for a steady supply of food. Think about it. Plant-based foods are plants that have been cultivated for food over tens of thousands of years. Long before GMOs were even an issue, corn and wheat, for example, were cultivated by farmers over the eons into the food that humans eat today that bear little resemblance to the original plants that were first grown by our early ancestors. What we can objectively say about plant-based foods is that they are NOT acute poisons, but that does NOT mean that they are not full of chronic toxins. As early as 1990, researchers published research on plant-based foods containing natural pesticides long before GMOs ever became a health issue. Being paranoid about toxins will not improve your health. Normal plant-base foods purchased at a normal grocery store simply are NOT super saturated with synthetic pesticides, as many would try to make you believe. Ironically, vegetarians end up eating more food negatives than those eating a junk food diet do. "There is a very large literature on natural toxins in plants and their role in plant defenses. The human intake of these toxins varies markedly with diet and would be higher in vegetarians. Our estimate of 1.5 grams of natural pesticides per person per day is based on the content of toxins in the major plant foods ... The percentage of a plant's weight that is toxin varies, but a few percent of dry weight is a reasonable estimate." The bottom line is that all food naturally contains food negatives whether the food was organically grown, GMO free, or NOT. Humans have been eating these toxins in their food since the beginning of time. Irrational fear of GMO food is more due to unscrupulous individuals in the natural health movement intentionally playing on your fears of the unknown, than to anything else. Folate is ubiquitous to a healthy whole food, plant-based diet. Folate is contained in most produce, regardless of its organic status. Folate is a known food negative for many older adults, that promotes the development of age-related cancer [Tapp 2012], especially in men while simultaneously protecting against heart disease. Nevertheless, for young adults of childbearing age, folate is likewise a food positive that is believed to help prevent birth defects. Another food positive of folate is that it helps reduce homocysteine levels in your blood, which is generally considered to be a risk factor for heart disease. This known folate issue takes the concept of the world being gray, rather than black and white, to all new levels. In the real world, nutrients that protect against heart disease could be simultaneously promoting another lifestyle disease, such as cancer. Good health starts in the kitchen rather than at the food market. It is reasonable to assume that your choice of cooking methods introduces food negatives into your diet, regardless of whether the food is organically grown, GMO free, or NOT. It has been definitively shown that cooking meat and fish introduces both carcinogens and mutagens into your diet. Whether or not that happens in plant-based foods is NOT quite so clear cut. The strongest case can be made for the harmful effects of high temperature cooking with dry heat on fats and oils contained in your meals, the degree to which you brown or burn your food, as well as the possibility of introducing contaminants using water. Furthermore, the fumes emitted from fat and oils while food is being cooked are known to be toxic to your health. The same food can be cooked using a large variety of cooking methods, such as steaming, microwaving, boiling, pressure-cooking, crockpot slow cooking, griddling or frying, deep-frying, stir-frying, broiling, barbecuing, and baking. Each method of cooking food offers a different set of positives and negatives, depending on a number of different factors. There is no one best way of cooking your food. "The cooking of food is also a major dietary source of potential rodent carcinogens. Cooking produces about 2 grams (per person per day) [for those consuming the standard American junk food diet] of mostly untested burnt material that contains many rodent carcinogens ... as well as a plethora of mutagens." Dry heat cooking is the method most likely to introduce food negatives into your diet. The Western food palletÂ gets a lot of its unhealthy food flavors from browning food, scientifically known as the Maillard reaction. Meat and all foods containing protein when subjected to dry heat will result in the formation of unhealthy advanced glycation endproducts (AGEs). Dry-heat cooking refers to cooking with a high-heat source that is 300Âº Fahrenheit (150Âº Celsius) or hotter. Cooking your food with water introduces the possibility of contaminates from toxins contained in the water. While most water supplies in America are relatively safe, that is NOT always the case. Some public water supplies have turned out to be contaminated with toxic levels of chromium and even Kepone. In general, low temperature cooking with moist heat will introduce fewer food negatives than high heat that promotes browning. Avoiding cooking your food with large amounts of fat in your dishes will also help. Frying food with the wrong kinds of oil is bad for your health. When grilling or pan-frying food, coconut oil handles high heat temperatures a lot better than canola, corn, or olive oil does. Next preferable to coconut oil would be peanut oil for frying food. Similarly, microwaving at low power can be healthy because it avoids the use of water that may contain contaminates. The cooking methods least likely to introduce food negatives into your diet appear to be the moist heat methods of steaming, microwaving at low power, followed by boiling. There is an old restaurant trick of always boiling chicken in order to pre-cook it. This guarantees that deep-fried chicken will always be done inside. Pre-boiling meat will, also, transfer a lot of fat, and other food negatives, into the cooking water. Boiling chicken gives you another opportunity to introduce healthy food spices, such as rosemary or turmeric, into your chicken. Furthermore, your choice of cooking utensils affects how carcinogenic your diet is. In other words, whether your pots are made out of iron, aluminum, copper, plastic, glass, ceramics, or have a non-stick coating makes a difference as to what toxins are introduced into your cooked food. Glass and ceramics react the least with food, and are thus the healthiest to cook with. Use of plastics should be avoided in microwave ovens. Always microwave food in Pyrex glass containers. Microbiome or NOT - All food spoils over time. A major problem always faced by man is that plant-based foods do NOT last forever. Some plant-based food age well for a few months, whiles others do NOT. Prior to the cultivation of legumes and grains, most plant-based foods eventually spoil over time. Over the eons, various food preservation methods have been developed. Just because a preserved food contains no acute poisons, does NOT mean that the preserved food does not contain chronic toxins. The recent revival of fermented foods, and food canning, in the health food market does NOT mean that these so-called fermented health foods are toxin free. The only remotely safe form of food preservation is refrigeration. All real food is constantly rotting, oxidizing, and is in one state of decay, or the other. This is why fruit ripens over time. A good rule of thumb is that if a processed food requires no refrigeration, then it is NOT healthy to eat. Of course, legumes and grains when properly dried and stored can survive for thousands of years and still be able to germinate. Often, the food negatives introduced by the rotting process consists of bacteria and fungi growing on your stored food, or the toxic byproducts of these growing organisms even if you call it the microbiome . This brings up kitchen hygiene, or the food handling and preservation methods utilized in your kitchen, and a variety of other issues; such as how long you keep cooked leftovers in your refrigerator. The bottom line is that the rotting process introduces food negatives into your diet whether the food was organically grown, GMO free, or NOT. The longer you store food in your kitchen the bigger these food negatives will become. Clearly, whether or NOT you are talking about organically grown and GMO food has absolutely nothing to do with these food negatives. On Organic Food: "It's a bunch of bull. How do you know what's really organic? Today, there's all these impurities in the water and the air. The water for the fruits and vegetables has junk in it. If you get enough vitamins and minerals out of normal food and whole grains, and you get enough proteins and exercise (that's the key) then nature builds up a tolerance to all of these things. It's survival of the fittest. You can't have everything perfect, that's impossible, but the fit survive. The fit can handle the impurities in the air and in the water, but the poor people who are sick, it really affects them more." Dennis Hughes Interviews Jack LaLanne, 2001. In conclusion: Eating a healthy whole food plant-based diet naturally contains pesticides, carcinogens, mutagens, and even clastogens that can be measured in parts per million. In fact, the more plant-base foods that you eat the more of these natural toxins you will be consuming. Relax and enjoy your life, there is little to worry about. As long as you use a variety of different cooking methods, as well as good kitchen hygiene, all these food negatives will NOT adversely affect your health. Consuming trace amounts of toxins is a normal part of life, which your body has evolved to handle over the eons. Working on maintaining good natural detoxification in your body, as well as implementing variation in your diet is how the rational person protects themselves against all toxins in their diet. Relax and learn how to enjoy your life. Living your life paranoid about absolutely everything that you eat is extremely non-productive. This article was originally published on 08/23/2012. Dietary pesticides (99.99% all natural). Ames BN, Profet M, Gold LS. Proc Natl Acad Sci U S A. 1990 Oct;87(19):7777-81. Nutritional factors and gender influence age-related DNA methylation in the human rectal mucosa.